Public elementary schools in Japan are currently tackling the enormous challenge of preparing to teach English as a formal academic subject to their pupils, an endeavor which will officially begin in 2020. Unfortunately, however, it has been reported that teachers are not well prepared for this endeavor, and their anxiety regarding English instruction has been dramatically increasing. To help partially ameliorate this situation, an innovative in-service teacher training approach was developed and then validated. Data collected by questionnaires as well as reflective reports, interviews and field note entries were analyzed both quantitatively and qualitatively. The findings suggest that positive or constructive relationships between school administrators and teachers are crucial for the successful implementation of this experimental approach. This study was supported by JSPS KAKENHI (the Grants-in-aids for scientific research) grant number 16K02989. The authors would like to express their gratitude for the support and cooperation of the teachers, students, school administrators and the local Board of Education involved in this project. Why do you think many elementary schoolteachers in Japan are rather reluctant to teach English? 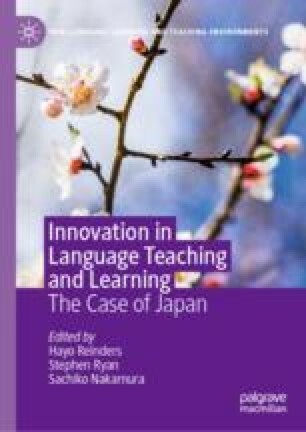 What factors do you think could contribute to the reduction of teacher anxiety in teaching English at the elementary school level in Japan? What additional qualities of school administrators do you think can facilitate the implementation of the approach described in this chapter? What kind of theories—other than activity theory—do you think are applicable to the interpretation of the results reported in this chapter? British Council (2015). Joint project with MEXT to improve English teaching. Retrieved from https://www.britishcouncil.jp/en/about/press/20150520-mext-teacher-training-leep. MEXT. (2017a). Gakko kihon chosa [Fundamental statistics regarding schools in Japan]. Retrieved from http://www.e-stat.go.jp/SG1/estat/NewList.do?tid=000001011528. MEXT. (2017b). Heisei28nenndo eigokyoiku jitsushijyoukyou chosa [A 2016 survey on English language education]. Retrieved from http://www.mext.go.jp/a_menu/kokusai/gaikokugo/1384230.htm. OECD. (2014). The OECD teaching and learning international survey 2013. Retrieved from http://www.oecd.org/edu/school/talis-2013-results.htm. OECD. (2017). Education at a glance 2017: OECD indicators (Country note). Retrieved from http://www.oecd.emb-japan.go.jp/files/000289921.pdf.